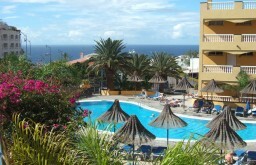 This lovely set of apartments is set apart from the busy tourist area and it’s about a 25 minute walk to the beach. This means that whilst you have easy access to the town’s features and activities, on an evening or on a day when you just want to relax you’re not trapped in the busy tourist area surrounded by noise and crowds. The hotel is very calm and relaxing and there’s a lovely swimming pool on site where guests can relax together- sometimes there’s even a welcome party with sangria for new guests! For eating, there are a great deal of cafés and restaurants nearby or into the town near the beach, so depending on what you want and how far you’re willing to go you can always find something. The nicest feature, however, is the quiet and relaxing holiday experience you’ll get. A great atmosphere and a lovely quiet complex- perfect for couples or older visitors who just want to relax and have a good laid back holiday.